ULI Toronto and twenty of its members had the pleasure of being taken on a tour by The Centre for Addiction and Mental Health’s (CAMH) Senior Information Officer, Nadia Ramadhin, of the hospital’s historic 27-acre Queen Street location, which is currently in the third phase of a bold and innovative redevelopment initiative. 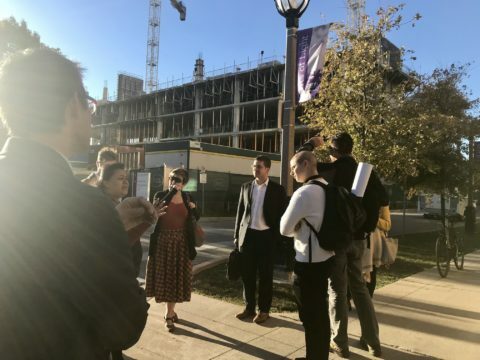 David Cunic (Vice President, Redevelopment) of CAMH along with Ronald Mar (Principal, Architecture) and Ena Kenny (Senior Interior Designer) of Stantec presented on the proposed design for the multi-phase master plan at the end of the tour. In 1998, the provincial government announced funding for mental health facilities across Ontario. CAMH was one of several facilities chosen in Toronto. In consultation with Urban Strategies, a master plan was created for the CAMH site at Queen and Ossington. The main goal of the master plan was first and foremost to create a site that was welcoming for both patients and the community. In order to achieve this, a permeable, mixed-use site with two parks and retail facing Queen Street was proposed in close consultation with city staff and community members. Both Ossington and Adelaide will be extended through the site, encouraging porosity and more vibrant streets through a site that once provided nothing but a blank wall to Queen Street. The Queen Street location of CAMH feature meeting spaces and a gymnasium which are all available for the entire CAMH community to use — including patients and their families, staff and neighbours’ community use. Patients at CAMH can volunteer with Foodshare at the nearby community garden where they can obtain useable skills. CAMH’s new facilities offer a well-rounded space for healing, complete with a multi-faith, multi-purpose room that includes a footwashing station, direct-to-outdoor ventilation and floor-to-ceiling windows that allow natural light to fill the room. Integrating CAMH’s clinical, education and research services with the surrounding Queen West community, Phase 1C of consists of two new hospital buildings which are currently under construction. Once complete, the new buildings will boast carefully-curated retail spaces that will be aimed at benefiting new and existing residents. Stantec’s Ronald Mar was faced with constraints when he first joined the CAMH Phase 1C redevelopment process. The site plan application had already been submitted and conditions were already set in place by the City. Despite being unable to deviate from the design or the materials chosen, they were able to create a well-articulated building design for the mid-rise building at Queen and Ossington with a double-height Auditorium above the ground floor and lobby area that draws the public in. Through the careful refinement of the built form, Stantec’s proposed design will create a gateway into the CAMH campus that coincides with their vision of creating a welcoming site. Stantec’s proposed design for Phase 1C will also achieve LEED Gold design standards. Stantec’s inclusive approach to the interior design was to collaborate with past and current patients and their families to create a safe space where they feel comfortable spending time in. Stantec’s Ena Kenny consulted with 15 groups of clients (both past and present) and family members to achieve the right feel for the colour palettes, artwork and finishes. Some of the artwork featured throughout the buildings was even created by past patients. The interior makes links to nature and outdoors through the use of wood materials and nature-inspired colour schemes in addition to bringing in as much natural light as possible. The tour concluded with more conversation over delicious bites and drinks at Otto’s Bier Hall, generously sponsored by Stantec. We would like to thank all applicants for this year's Curtner Leadership Program & congratulate those who will be part of the Class of 2019.